AFE: *in a conspiratorial whisper* Hi, it’s me, AFE Smith. Welcome back to the author interview series Barren Island Books, where my guests are exiled to a remote island with only five books for company. Um, you’re probably wondering why I’m whispering and hiding in this tree dressed as Jane from Tarzan. The circumstances are a bit different today. You see, some jerk has taken over my island for the purposes of talking exclusively about his own books and I’ve had to sneak onto the island to stop him. He thinks he’s tough and doesn’t have to play by “island rules”, but don’t worry – I’ve got a plan to take back my island, to take back my interview series. The pilfering pirate’s podium is just below. Yeah, I see him now. Just listen to this hot-air windbag and I am certain he’ll incriminate himself before I attack. Just listen to him … I’ve got a surprise for him. Dean: My loyal fans. Thank you again for joining me on Dean’s Island. Now I know some of you have heard the whinings of a certain red-headed novelist who thinks she developed the idea of stranding an author on an island, but it’s not true. I came up with this concept longgggg before Little Red stole it from me. Stole it from me, you hear. This is my show! Heehee, a direct hit to the mouth. That’ll shut him up. Dean: *spitting blood and pressing button on remote control* Not so fast, you crimson-headed woodpecker! AFE: Yeah, that’s right. I jumped the shark. And now, I’m going to weaponise it. Hey Dean, would you rather wrestle a bear or punch a shark? I’m guessing you wouldn’t choose the shark. Haha. Dean: You scarlet-headed ostrich! This is my island! AFE: Didn’t knock you out, huh? Must be that thick skull of yours. Wow, you’re a tough nut to crack. Ha, see what I did there? As I was saying. My new fantasy murder mystery Darkhaven has just been released, so if you want action, intrigue, swordfights, romance, a pistol-packing mercenary and a really unique city, you should definitely check it out. You can pick up the ebook for only $3.99, which is clearly a bargain though I do say so myself. That sound good to you, Dean? AFE: Exactly. Now, before we whisk Dean away, we have one last decision to make: How should we expel him from the island? I can kick him into the lagoon where the shark will eat him … nah, it’ll probably spit his rotten self out. I think the trusty old cannon is the best idea. Well, it’s been fun. Thank you for joining us, Dean, and I hope you enjoy your trip! And the rest of you who have been so kind to join us, I hope you enjoy Darkhaven. You can find out more about the Darkhaven blog tour here. If you’re taking part in the scavenger hunt, here’s today’s letter! 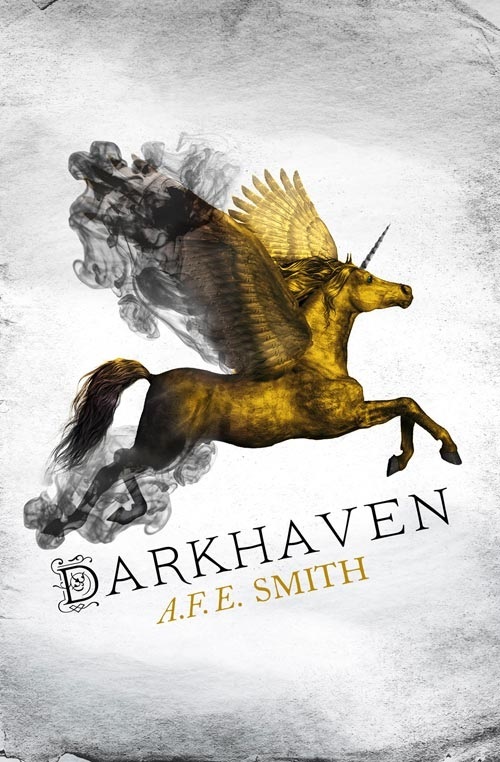 This entry was posted in Uncategorized and tagged Afe Smith, Afe Smith Barren Island, Afe Smith Darkhaven, Darkhaven by dlombardo2012. Bookmark the permalink.